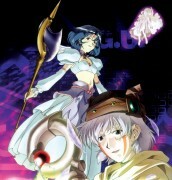 Tagged under Yoshiyuki Sadamoto, Bee Train, .hack, Series. In a not-so-distant future, a popular game hits the nations. Millions of users join this role-playing game filled with monsters to slay, treasure to recover, and a place to meet new people. Welcome to the World. A young Wavemaster called Tsukasa one day wakes up in this strange place. He does not know who he is, what he is doing here, and lest of all how he got here. When he tries to log out, he realises he cannot do so. In the World, if a player dies, they restart where they last saved. For Tsukasa, however, it is a whole different game. If he dies in the World, he will die and will not be able to re-start the game. Luckily, he meets some friends along the way, and together they travel the World hoping to find the legendary "Key of the Twilight" as well as what is going on behind Tsukasa's past. Will Tsukasa ever get out of the World, or will he be trapped forever? 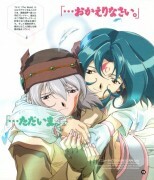 The series .hack//sign is so special that the rank has to deserve a 10. Why? 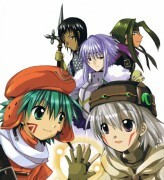 Did you know that Bandai's greatest risk to their company was the series .hack//sign along with the manga, the OST, the OVA and the video game for the PS2. It was all released at one exact moment in time where every single employee for Bandai's heart skipped a single, solitary beat. Then as though it were magic or the working of something beyond normal human comprehension, their plan worked!!! It was a huge sucess! Books, video games, anime box sets and rating flew off the charts and shelves! 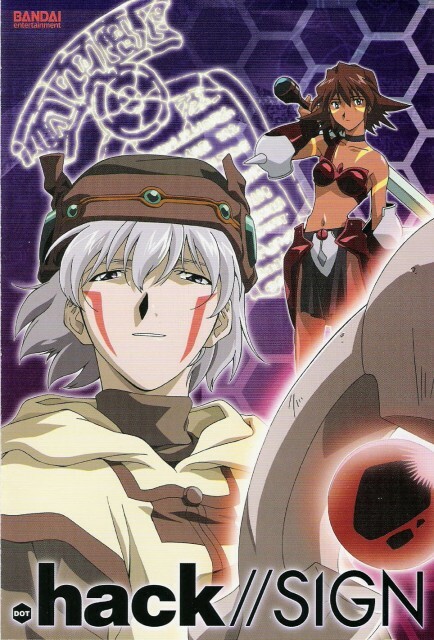 Anyway getting back to why that all went down the way it did is because people saw .hack and thought 'They put so much into this! Editors everywhere must be going nuts because of the '.' part in . This felt like such a different anime from others I had seen up to that point. To actually "be" in the virtual game world seemed so exciting and fun... what could possibly go wrong? Getting trapped in the world and not being able to wake up is quite a serious ordeal. SAO takes this same idea and expands on it a bit. An interesting tale that takes place in an MMO called The World & revolves around a young character who goes by the name of Tsukasa. I really liked the series, but there were plenty of points, where the series seems to drag. This is an anime that relies very little of action, and more of the characters and main mystery of the main character, and the the phenomena surrounding him. There's one thing you'll either like or dislike about this anime as that is the fact that anime talks - a lot. Long, descriptive conversations between the characters will take place in many episodes, and while at times I find it tedious, it serves to make the anime more complete, it makes the characters more three-dimensional, and eventually makes the series engrossing. The main character is an interesting one, and the sharp theme of escapism is great focus of the series. One of the best aspects of the show is the main twist; which was unexpected but fantastic. So much to love about this series! The setting leaves so much room for interpretation and, obviously, expansion. The art is amazing and the music, being done by Yuki Kajiura, is fittingly epic. The plot actually focuses on moving the story forward instead of being filled up with action sequences, though I'll grant you that there was room for more of those just by virtue of the setting. It was paced in such a way that the audience could almost be one of the characters themselves, in that the plot is revealed with very little foreshadowing. That was a major hook that kept me watching episode after episode. Like I said, there's a lot to love about this series, and it will forever remain one of, if not my top, favorites. Tsukasa a player/prisoner in The [world] and is unable to log out, he doesn't know why. Weird things keep happening to him, and his new friends especially Mimiru start noticing. Aura is an NPC that Tsukasa sees floating above a bed and he wants to wake her up. Tsukasa's friends want to help him so its then they begin their perilous journey into The [World] while avoiding the authorities and making friends with accasionally special uses. Near the end everyone is shocked find out the most freakiest things' responsible for everything. *SPOILER ALERT!!! Tsukasa is surprised to find out that he in real life is a girl and is in a coma. Bear a friend, has said that when Tsukasa wakes up that he would like to adopt her. In the end Aura wakes up and sets Tsukasa free from The [World]. The real Tsukasa is seen exiting the hospital and walking and unsuspectingly running into the real life "Subaru". Well pretty much it ends happily. I liked this series better then the second series; better quality music, more action and drama, a lot more characters. Again, the ending leaves you with the feeling of wanting more, but you can't expect to know every single detail about a character.